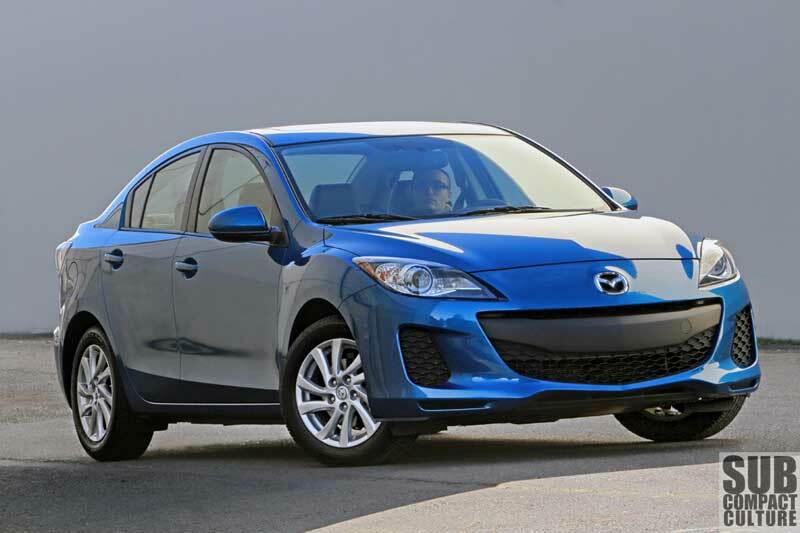 The Mazda 3 SKYACTIV has noteworthy driving dynamics, a great interior, and is fuel efficient. Photo by Curtis Reesor. Ever since the Mazda3 debuted 2004, it’s been known as a “driver’s car.” Great driving dynamics and responsive engines—both normally aspirated as well as turbocharged—have made and continue to make this an enthusiast’s choice among many “driving appliances.” For 2012, Mazda has released another 3 model, this time setting its sights on efficiency. 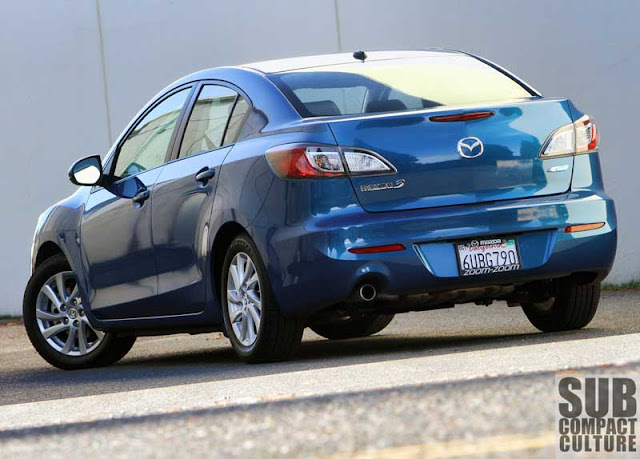 Called SKYACTIV, this 3 comes with a high-compression 2.0-liter four cylinder engine with direct injection, and unique body/chassis features that help the ’12 Mazda 3 join the ranks of other compact sedans that now get 40 MPG on the highway. Welcome to the club. At first glance, this 3 with SKYACTIV technology seems just like every other sedan model in the 3 lineup, but it isn’t. 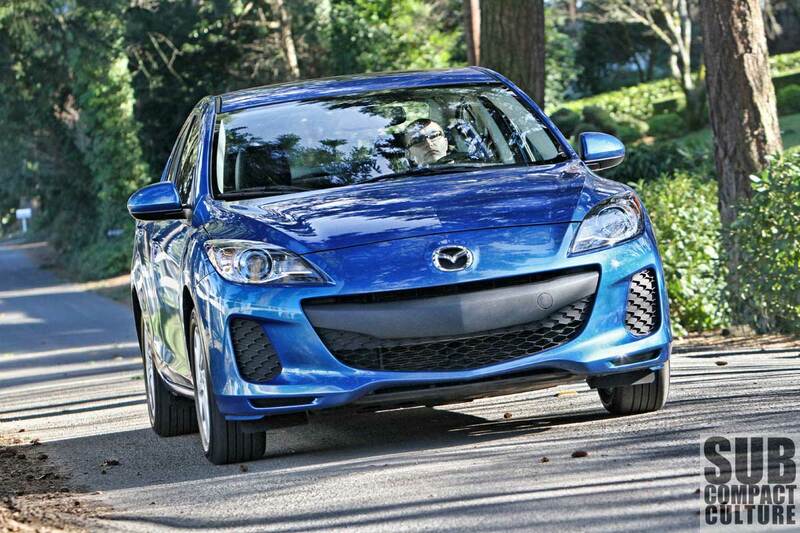 The body on the SKYACTIV model is 8% lighter and the chassis is 30% stiffer. These factors help the 3 achieve its EPA estimated 28 MPG city and coveted 40 MPG highway rating when equipped with the SKYACTIV-DRIVE six-speed automatic. You can’t really see all this technology. But what you can see on the outside is a mix of distinctive styling that also happens to be a bit on the bland side. There’s no mistaking this is a Mazda 3, but it doesn’t quicken my pulse. But there are many other aspects of the car that are outstanding. Looks aside, the SKYACTIV-G engine offers up 155 hp and 148 ft./lbs. of torque. Our test model came equipped with the aforementioned six-speed automatic with manual shifting ability. Shifts are smooth, and the manual shifting is better than average. The SKYACTIV-G engine is meant for fuel economy. In fact Mazda claims 15% more than other non-turbo 3s. Unfortunately, it often feels like it’s built for fuel economy. Acceleration isn’t all that brisk, and throttle response was slightly awkward. At slower speeds, there is enough torque to keep things engaging, though. Luckily, like most Mazda vehicles, this one has outstanding driving dynamics. The steering, the seating position, the way things just seem to all come together—yes, this is still a driver’s car at its core. The 16” alloy wheels and 205/55/16 tires aren’t of the high-performance variety, but they aid in giving the car a compliant ride. In fact, we loaded the 3 up with three other people for a 250 mile drive into the Columbia River Gorge, and it rode smoothly and comfortably. In fact, it’s hard to tell you’re in a compact car at points. One of the car’s highlights is its steering. It’s wonderfully weighted and feels very precise. Cornering is done confidently with minimal body roll. This proved that the 3 is just as at home in the curves as it is cruising the interstate. Since this was the Grand Touring model it had every bell and whistle you could want. It had features you likely wouldn’t expect on a compact, let alone a compact that costs less than $25,000. I’m talking about features like blind spot detection, outstanding heated leather seats (with five heat levels) and an eight-way adjustable driver’s seat. But wait, there’s more! The car also has an easy-to-use navigation system, a 10-speaker 265-watt Bose stereo, and an optional interior illumination kit that emitted a blue glow in the foot wells. To top it off, this 3 had rain sensing wipers and pivoting adaptive Xenon headlights that turn with the steering wheel. These are features I’d expect on a $40,000+ luxury car, but not on a Mazda 3. Every time I got in the 3 it felt like a much more expensive vehicle. Very nice, and quite the bargain. The only interior qualm I came across, I actually didn’t experience. Rather, the issue came to me via passenger feedback. Three passengers, all between 5’10” and 6’1”, commented about being uncomfortable in the 3 in both the front and back seats. However, us shorter folk (5’7” or under) found the car comfortable. Everyone found the 3’s trunk to be spacious. We were easily able to put two large suitcases plus some backpacks in the trunk. After logging more than 305 miles on the 3, we were able to average 32 MPG—1 MPG over the EPA combined estimate. Hey, not bad. Add to this a remarkable combination of interior design and build quality mixed with a heaping helping of technology, and the 3 is a unique package. Although its looks might not be terribly exciting, it is a very nice vehicle overall and a heck of a deal. With notable fuel economy, a great interior with plenty of tech goodness, fantastic driving dynamics, and a sensible price, this car should be on every compact car shopper’s list, so long as you’re under 5’10”.